Miniature Windblock Fleece Bodysuits and Hooded Windblock Bodysuits! Windblock Bodysuits have 3 layers and is waterproof and windproof! It offers the most warmth and protection of all bodysuits. The fleece is a unique fabric that is designed to insulate the body from cold temperatures down to frigid conditions. 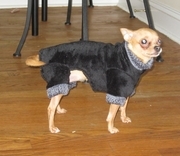 All our Outdoor Clothes have leash openings, with Hooded Bodysuits offering one on the neck and one on the back. Windblock Bodysuits provide outstanding warmth and comfort, as well as great looks!